Today is Saint Lucia's Day, a much beloved day in Sweden. It's the darkest day of the year, which means that once it's passed, it gets lighter. So Lucia is the bringer of light. 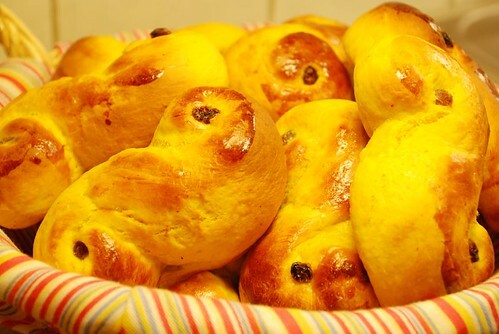 I was going to make some lussekatter today, but because of a busy work schedule and thus not enough time, I didn't get the chance to! I'm from Norway, but live in Glasgow, so I thought I would bring the tradition to the UK. Whenever I saw you mentioning that they get a little dry unless you eat them on the same day though, I thought that I should save it for maybe next year, as there would be way too many lussekatter for my boyfriend and me without being able to bring some in with me to work. I had my first St Lucia bun today (from a bakery I confess) and liked it! Next year, if our house is done, I will try to bake my own-from your recipe - but if not, it will be back to the bakery to buy more! I saw your comment on Twitter about the soft gingerbread. I found this recipe several years ago, and think that it is quite addictive and delicious. I don't remember whether I made any changes in the original recipe or not. Sincerely, Eileen from Western New York PS I greatly appreciated your identifying all of the lovely treats in the picture from the buffet. Pour into buttered/floured/crumbed pan and bake slow in lower oven until toothpick indicates it's done. I just heard from a cousin in Finland that a Julia Hanhikoski was elected to Lucia for Finland and the ceremony was in Helsinki on the 13th of December. After some more research, I will know for sure if she is related to me by half -cousins. Interesting to find out.